A book that gives great ideas on how to keep your budget down and you garden growing. Looking for some great ways to keep your garden on budget this year? This book has amazing tips and ideas for this very thing! This book created by landscape designer and horticulturalist Maureen Gilmer addresses gardening while conserving water and minimizing energy dollars, and creating an eco-friendly landscape. The guide also includes a chapter on growing vegetables and offers creative ideas for adding garden structures and yard enhancements to the landscape. This book helps you conserve your resources, while still addressing all of the important upkeep of your current or new garden. 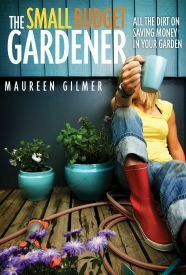 Maureen Gilmer has risen to the top of gardening media in America through books, television, radio, newspapers and the Internet. She is the author of more than 15 gardening books and writes Yardsmart, a national color newspaper column in its fourth year syndicated weekly by Scripps Howard News Service. She is host and project designer for the television series, Weekend Gardening, on the DIY Network. Her articles and photography have appeared in national magazines and frequently appears on numerous television and cable programs. I didn&#x27;t get to B&amp;N today! UGH!! Must go tomorrow!!! Yes, Santa...PLEASE?!?!?! I&#x27;m going to Barnes and Noble at lunch!!!! Gotta check this out!